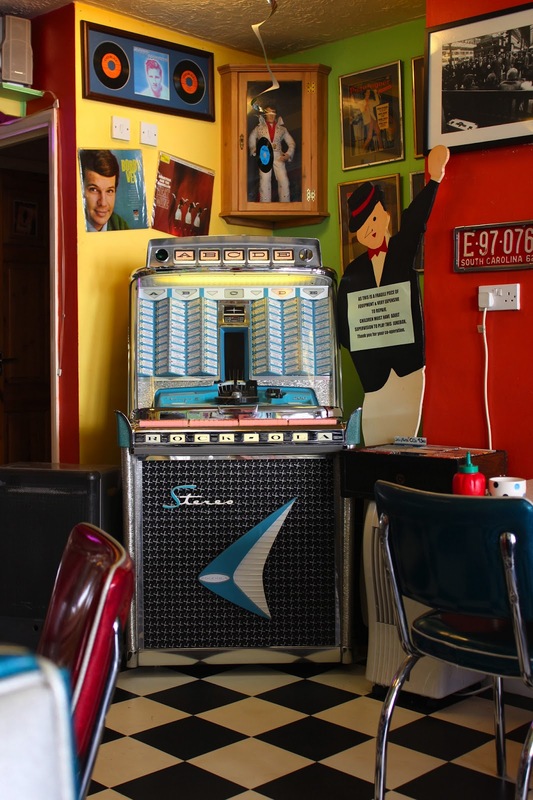 Rock Ola is just a few minutes walk from Brighton train station. The interior is stunning with so much to look at. The furniture here is excellent and the seats beautifully upholstered. 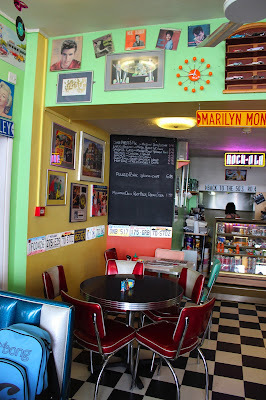 Everything blended together perfectly in this small but nicely laid out 1950's style diner. 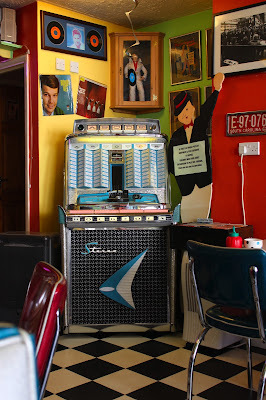 The jukebox in the corner is free to play. 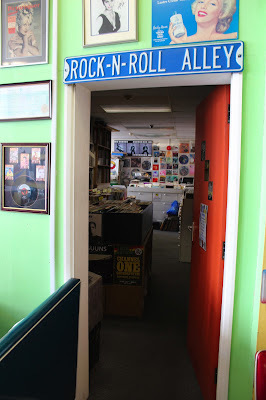 Through Rock n Roll Alley is an excellent adjoining record shop! The menu caters for everyone and prices seemed reasonable. Salt & Pepe along with the squeezy tomato will take care of things once the food arrives! I usually go for coffee but today I went for tea in a great mug! I loved the plate too but there was far too many empty spaces on it, tomatoes and mushrooms would have made it look so much more complete. That said though everything on the plate was piping hot and tasted delicious. The fried egg was stunning and the hash browns golden and crispy. A quality pork sausage accompanied some nicely browned bacon. I think the veggie breakfast looked much more complete with the tomatoes. My wife asked for extra tomatoes, a wise move that I wish I had done too. A slice of toast came with each breakfast served on a fantastic plate. 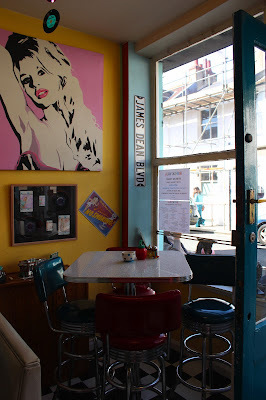 I loved the 1950's style table top patterns! Some friends living in Brighton were getting married so we had booked a hotel for the night which was very reasonably priced but didn't include breakfast. After an excellent wedding we woke up the following morning feeling really hungover! 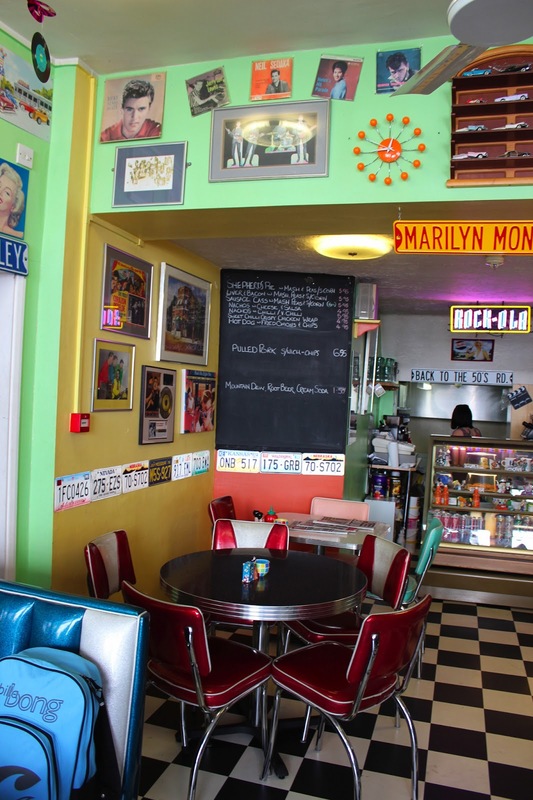 A walk along Brighton pier didn't seem to shift the hangover very much so we checked out of the hotel thinking food was the way forward and headed to Rock Ola..
Veggie option Yes, vegetarians and vegans are well looked after here. Brighton has some excellent places for veggie and/or vegan eating - this one looks great and I'll give it a try next time I'm there. Aren't you being a tad harsh with only 4/10 for contents and presentation? That's really low - looked ok to me, though if I'd been the chef I might have tipped some more beans into the gaps for purely aesthetic reasons! 4 = Not very good which I felt was fair of a breakfast with so few items yet so much empty space on the plate. I could have scored it 5 which = ok but I didn't feel these 2 issues were ok so went for the 4. Everything else about Rock Ola I loved though!! Something just struck me..."Vegan" on the menu and it gives the impression that it's serving meat? Presentation has scope for improvement here, the beans are very much on the edge, just reshuffling the food would get rid of empty space too.